Causal factor tree analysis is a Root Cause Analysis technique used to record and display, in a logical, tree-structured hierarchy, all the actions and conditions (or Causal Factors) that were Necessary and Sufficient for a given consequence to have occurred. Provides structure for the recording of evidence and display of what is known. Through application of logic checks, gaps in knowledge are exposed. Tree structure is familiar and easy to follow. Can easily be extended to handle multiple (potential) scenarios. Can incorporate results from the use of other tools. Works well as a master investigation/analysis technique. Cannot easily handle or display time dependence. Sequence dependencies can be treated, but difficulty increases significantly with added complexity. Shows where unknowns exist, but provides no means of resolving them. Stopping points can be somewhat arbitrary. Branch: A cause-effect link from one item in the tree to another immediately above it. This assumes the tree is drawn from the top down, i.e. consequence on top and causes below it. Chain: A continuous sequence of branches from one item that is lower in the tree, through one or more intervening items, to one item that is higher in the tree. Endpoint: An item in the tree that has no branches leading into it; the first (or lowest) item in a chain leading to the final consequence. This is one short example that illustrates the basic structure and flow of a causal factor tree analysis. In this case, the problem/event is shown at the top and all the causal factors are below it. Causal flow is generally from the bottom to the top; branches, chains, and endpoints are clearly identifiable. Tree structures are often used to display information in an organized, hierarchical fashion: organization charts, work breakdown structures, genealogical charts, disk directory listings, etc. The ability of tree structures to incorporate large amounts of data, while clearly displaying parent-child or other dependency relationships, also makes the tree a very good vehicle for incident investigation and analysis. Combination of the tree structure with cause-effect linking rules and appropriate stopping criteria yields the causal factor tree, one of the more popular investigation and analysis tools in use today. Typically, a causal factor tree is used to investigate a single adverse event or consequence, which is usually shown as the top item in the tree. Factors that were immediate causes of this effect are then displayed below it, linked to the effect using branches. Note that the set of immediate causes must meet certain criteria for necessity, sufficiency, and existence. More information on what constitutes a necessary and sufficient cause can be found in this article on the definition of cause. Proof of existence requires evidence. Once the immediate causes for the top item in the tree are shown, then the immediate causes for each of these factors can be added, and so on. Every cause added to the tree must meet the same requirements for necessity, sufficiency, and existence. Eventually, the structure begins to resemble a tree's root system. Chains of cause and effect flow upwards from the bottom of the tree, ultimately reaching the top level. In this way, a complete description can be built of the factors that led to the adverse consequence. Often, an item in the tree will require explanation, but the immediate causes are not yet known. The causal factor tree process will only expose this knowledge gap; it does not provide any means to resolve it. This is when other methods such as change analysis or barrier analysis can be used to provide answers for the unknowns. Once the unknowns become known, they can then be added to the tree as immediate causes for the item in question. If the cause is removed or corrected, the adverse consequence does not occur. The cause is a fundamental limit of the system design. A causal factor tree will usually have many endpoints. The set of all endpoints is in fact a fundamental set of causes for the top consequence in the tree. This fundamental set includes endpoints that would be considered both beneficial or detrimental; every one of them had to exist, otherwise the consequence would have been different. Endpoints that require corrective action would typically be called root causes, or root and contributing causes if some scheme is being used to differentiate causes in terms of importance. In summary, the causal factor tree is an investigation/analysis tool that is used to display a logical hierarchy of all the causes leading to a given effect or consequence. When gaps in knowledge are encountered, the tree exposes the gap, but does not provide any means to resolve it; other tools are required. Once the required knowledge is available, it can be added to the tree. A completed causal factor tree provides a complete picture of all the actions and conditions that were required for the consequence to have occurred. Success in causal factor tree analysis depends on the rigour used in adding causes to the tree (i.e., ensuring necessity, sufficiency, and existence), and in stopping any given cause-effect chain at an appropriate endpoint. 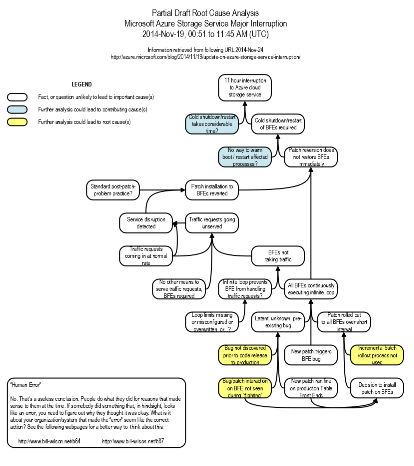 00.3 25-Nov-2014 Example causal factor tree analysis added to article. 00.2 25-Sep-2014 Minor content/formatting changes + link updates/replacements. 00.1 12-Aug-2005 Renaming and terminology revision to "causal factor tree." 00.0 09-Aug-2005 Initial revision issued for public consumption/comment. nice posts! are you familiar with the iMODELER and its feature of the KNOW WHY Method? Hello Kai, thanks for the comment. I have not heard of this before, but I’m checking it out now. The iModeler software looks very interesting!